"The November Summits in Retrospect"
The “quasi-alliance” (jundomei) is an increasingly fashionable term of the Japanese government as well as the wider policy community in Tokyo to describe its rapidly growing security relationship with Canberra.1 Although the precise meaning of the term is yet to be defined (and the government certainly does not have in mind the meaning for this concept put forth by Victor Cha for Japan-ROK relations), it is clear that the emergence of the concept reflects growing expectations for Australia to work closely with the Japan-US alliance, particularly in defending the open and rules-based order now under “salami-slicing” attacks by the rising dragon. Indeed trilateral activities over recent years have, in important ways, measured up to such expectations. Joint releases of the trilateral meetings, e.g., the foreign minister-led Trilateral Strategic Dialogue (TSD) and the Trilateral Defense Ministerial Meeting, consistently include the explicit words that the three countries oppose China’s attempts to alter the status quo by force in both the East and South China seas. A few days after Abe Shinzo met with Malcolm Turnbull in Antalya at the G20, the Australian leader met with Barack Obama in Manila at the APEC summit. The combined effect of these two bilateral meetings was to reaffirm the importance of the fast-developing trilateralism. The three parties are working hard now on moving trilateral relations beyond a mere collaboration in words, translating the emerging momentum into more tangible policy cooperation in deeds. One of the hotly discussed areas in this context is potential cooperation on Australia’s Future Submarine Program, which has featured prominently in Tokyo’s policy discussions over the past few years. After a series of discussions in its new National Security Council, on November 30 the Japanese government submitted its plans to build submarines for the program, participating in the foreign partner selection process, i.e, the Competitive Evaluation Process, whose results will be announced in 2016. Submarine cooperation would be fundamentally trilateral in nature. Given that the Australian government intends to install the US-made combat system in its future submarines, Japan-Australia submarine development cooperation would become intertwined with the US role in a long-term manner. Its implications have potential to go beyond industrial and arms cooperation. In fact, Nakatani Gen recently stressed this point in an unusually candid manner, saying that if Japan is selected as an international partner for this particular procurement project, it would even enhance “operational cooperation” between Japan, the United States, and Australia. The strategic significance of this remarkable statement cannot be overemphasized, not least because Chinese undersea naval activities have become increasingly expansive across the Indo-Pacific region. In light of this strategic reality, it is significant that Japan seeks to build closer coordination in the undersea domain among three countries while providing strategic support for a close US ally, Australia, whose submarine fleet is long known to be operating in regional waters including the South China Sea. Another item is the ongoing trilateral efforts for coordinating the efforts of the three countries in the South China Sea, particularly capacity-building assistance. In November, the Obama administration released a document entitled “US Building Maritime Capacity in Southeast Asia,” which lists ongoing capacity-building assistance programs, including the transfer of patrol boats to the Philippines navy, the commitment to continuing US support for the Filipino “National Coast Guard Watch System,” and the provision of assistance for the Vietnamese maritime ISR (intelligence, surveillance, and reconnaissance). This has become a collective effort. Bolstering the capability of Southeast Asian countries could contribute to regional security in a number of ways. First, it would gradually raise costs for larger powers to bully the smaller ones. By so doing, the capacity building might forge greater stability and reduce the need for US intervention, particularly in “gray zone” situations if the local powers become increasingly capable and do not have to ask for US help on every occasion. Tokyo and Canberra are both direct stakeholders in reducing the pressure and burden potentially imposed on Washington, not least because reducing the prospect of US interventions mean less likelihood that the United States will demand costly support from its allies. Against this backdrop, it is no surprise that Japan and Australia are increasingly active and collaborative in the capacity-building efforts in the South China Sea. Japan has offered six patrol boats for Vietnam and potentially more in the future, while building ten patrol boats for the Philippines coast guard. Australia has offered two landing ships to the Philippines as well as assisting the “National Coast Guard Watch System.” The three countries are now discussing ways to de-conflict and coordinate in order to maximize the synergy of their capacity-building assistance programs. The three countries are increasingly willing to use their peacetime military actions, particularly exercises, as a tool for strategic messaging vis-à-vis China. The United States has been conducting a wide range of operational activities in order to assert freedom of navigation, including within 12 nautical miles of China’s ongoing land reclamation activities. The persistent US presence in the South China Sea, according to US defense officials, would “complicate” Beijing’s strategic calculations and “deter” it from further deterioration of the situation. Japan and Australia are among the allies who closely support such US efforts. Since last year, Australia has started sending the AP-3c surveillance aircraft and personnel to join the US-Philippines Balikatan exercises, to which Japan’s Self-Defense Forces (SDF) also sent observers for the first time this year. Moreover, Japan started to send observers to participate in the series of US-Philippines amphibious and other exercises called Phiblex in 2014 and sent them again in 2015, while conducting its first bilateral maritime exercises with the Filipino navy in the South China Sea, practicing the Code for Unplanned Encounters at Sea (CUES), which was adopted at the Western Pacific Naval Symposium last year in order to promote some rules of the road in these newly crowded waters. While none of these exercises guarantees Japanese and Australian military support in a crisis, the explicit demonstration of joint military activities, particularly in contested areas, might make it difficult for Beijing to simply rule out some extreme conflict scenarios where China would need to face countries beyond the United States and Southeast Asian states. In the eyes of those, including this author, who have been closely following the evolution of trilateralism, the emerging prospects for (1) the defense equipment cooperation; (2) maritime security capacity-building coordination in assisting other states; and (3) expansive and more strategic use of maritime exercises are remarkable. Among experts, it was common until very recently to characterize the trilateral security activities, to the extent they occurred, as a partnership largely focused on non-traditional security areas. This reflected a robust record of operational cooperation in disaster relief, as seen in the wake of the March 2011 triple disaster in Japan and the November 2013 Typhoon Haiyan in the Philippines. This was particularly true of Japan-Australia security cooperation, which largely took place in non-traditional areas, as in disaster relief in response to the massive flooding in Pakistan in 2010 and the ongoing PKO activities in South Sudan since August 2012. Given the emerging strategic cooperation with more traditional security implications, the long-standing characterization of Japan-Australia-US partnership focused on non-traditional security issues is gradually becoming out of touch with the reality of the trilateral framework. There are at least two reasons why this new trend has arisen in recent years. Unsurprisingly, the first factor is China. In fact, one of the key reasons why the three countries used to keep their trilateral cooperation tightly within the non-traditional security sphere was their intention to avoid creating an impression of encircling China, in other words, to manage the risk of a self-fulfilling prophecy: we treat China as an enemy, China becomes our enemy. Back in 2007, Kevin Rudd suggested that security cooperation with Japan should focus on so-called “practical” collaboration such as counter-terrorism, anti-narcotics and peacekeeping operations (PKOs), not least because the United States and its allies should not appear to be “locking China out.” A similar point was later echoed by some Japanese cabinet members. Such careful management of China’s perception about the trilateral activities featured prominently in the thinking of officials in the three capitals at a time when China was still prioritizing its charm-offensive strategy. As China started showing a different face to the region, however, the three have clearly become willing to more explicitly and directly use the trilateral framework to defend the rules-based order in the Indo-Pacific region. In an interview with the author, an Australian official stressed with little reluctance that regional countries should not refrain from working together as China expands its activities in the South China Sea and beyond. Against this backdrop, the September change of Australian prime ministers from Tony Abbott to Malcolm Turnbull provoked some concern in Japan. Because of the widely held belief that Abbott’s critical attitude towards China’s challenge against the rules-based order was an important driving force of the closer ties between Tokyo and Canberra, Japanese media anxiously watched the way Turnbull and his government treated security issues involving China. After more than two months since the transition, there is clearly less concern expressed in Tokyo. The Turnbull government has so far demonstrated Australia’s continuing commitment to the open and rules-based order by agreeing to include explicitly critical words on China’s destabilizing activities in the outcome statements of the Japan-Australia 2 + 2 in November and, earlier, in the US-Australia ministerial consultations (AUSMIN) in October. The second factor, which underlines the emerging traditional security cooperation among the three countries, is the change of Japan particularly promoted under the Abe government. The revision of some long-standing principles and legal bases of Japan’s security policies are broadening the scope of trilateral security cooperation that Japan can pursue with the other two states. How Japan’s government describes the capacity-building is intriguing in this context. The Ministry of Defense describes the purposes of capacity building to include “enhancing the ties with the other assistance providing partners such as the United States and Australia.” Cooperation with Australia and the United States in the capacity-building assistance area is not just “means” but “ends” in itself. Arms cooperation has a similar dual nature. The strategy for defense material production and technological foundation building, adopted in Japan in June 2014, describes the international equipment cooperation as an important tool for enhancing the relationship with partner countries. Embracing this security evolution, which some call Japan’s “normalisation,” the three countries have added new tools to contribute to the rules-based order amid China’s expanding attempts to alter the status quo by force. The policy trends analyzed above remain unfinished business. The equipment cooperation, the maritime capacity-building assistance cooperation, and the more strategic joint training all remain at an embryonic phase. There are two compelling issues that the three countries need to address if they wish to further enhance the ongoing evolution of trilateral activities in the traditional security sphere. The first issue has to do with resources. For example, capacity-building assistance requires heavy and long-term investment of resources if it aspires to become more than a symbolic activity. Even though the earlier parts of this article emphasized potential big benefits which the capacity-building assistance might be able to produce in the long run, no tangible benefits can be anticipated unless sufficient resources are invested into this policy area. The Capacity-Building Office of the Japanese Ministry of Defense still faces severe constraints on the human and financial resources at its disposal. Should this issue not be addressed, it would remain difficult for the Defense Ministry alone to do more. The government has started to explore ways to address this constraint. As Abe explained in his 2014 Shangri-La Dialogue keynote speech, the government aims to seamlessly coordinate what are now separately operating policies, such as (1) the Ministry of Defense’s assistance activities; (2) Official Development Assistance; (3) defense equipment cooperation; and (4) potentially some “strategic financing” by organizations such as the Japan Bank For International Cooperation (JBIC).2 Different but equally difficult issues are facing Australia, whose capacity-building program continues to place the highest priority on the South Pacific, leaving few additional resources to be invested in Southeast Asia. The issue of resource limits remains a challenge for Washington as well. The other issue is what the author calls the “China Gap.”3 Indeed, in the history of trilateral cooperation, the divergence of China policies and perceptions among the three countries has occasionally hampered joint activities. From time to time, Australia has appeared to keep some distance from cooperating with Japan and the United States because of its concerns about China’s perceptions and reactions. 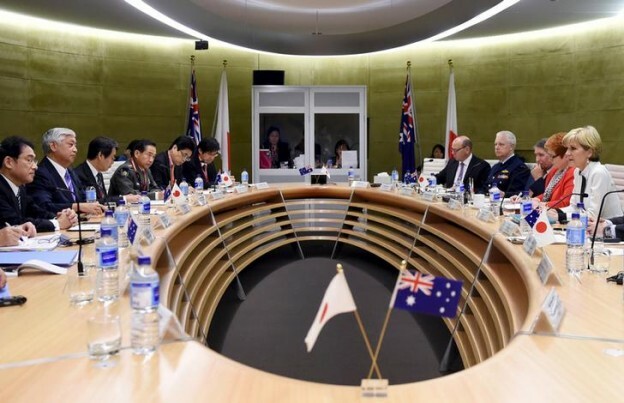 While Australia is increasingly willing to support Japan-US allied efforts to preserve the rules-based order, recent remarks by some Australian high ranking officials suggest that this “China Gap” issue has not yet disappeared. In her recent policy speech at the Center for Strategic and International Studies (CSIS) in November, Australian Foreign Minister Julie Bishop emphasized the importance of confidently accommodating the legitimate roles of the emerging powers. What she had in mind was the recent episode of the Asian Infrastructure Development Bank (AIIB), in which Australia chose to participate while Japan and the United States decided not to. Given that participation in the AIIB was an issue tabled in the National Security Committee (NSC) of the Cabinet, this was, for Canberra, not just an economic issue but rather a larger question of how to strategically engage the rise of China. Similarly, Abbott’s welcoming remarks for Abe’s visit to the Australian Parliament last year point to the existence of a gap. Abbott emphasized that Japan-Australia relations are “not a partnership against anybody,” noting that Australia welcomes China’s participation in RIMPAC exercises. Again, it is clear that in front of Japanese delegations, Abbott stressed the importance of engaging China. The degree of a “China Engagement Gap” among Australia, Japan and the United States has yet to be clarified. After the trilateral momentum was clearly reaffirmed by the bilateral summits in November, it may be high time for the three countries to initiate more candid and long-term discussions on the value and ways of shared engagement toward China. 1.Some parts of this paper are based on the takeaways from the workshop recently organized by Professors Wilhelm Vosse and Paul Midford at International Cristian University in Tokyo in November 2015. I appreciate the opportunity to hold candid discussions with them. 2.I learned this insight from the following report. Ken Jimbo, “Japan-US-Australia Cooperation on Capacity Building in Southeast Asia,” in Yuki Tatsumi, ed., US-Japan-Australia Security Cooperation: Prospects and Challenges (Washington DC: The Stimson Center, April 2015), 61-76. 3.I have coined this term in the following paper with more details. Yusuke Ishihara, “Japan-Australia Defence Cooperation in the Asia-Pacific Region,” in Tomonori Yoshizaki and William Tow, eds., Beyond the Hub and Spokes (Tokyo: NIDS, March 2014), 113-120, available at http://www.nids.go.jp/english/publication/joint_research/series10/pdf/06.pdf.